I have been meaning to make a cookie garland for a very long time, so was quite happy when my friend, Hani (of Haniela's) invited me to participate in her Easter Extravaganza! It provided the perfect push I needed to make something that I haven't made before. I was also happy to decorate the bunnies with polka dots. I followed the tips from the polka dot Queen herself, Bridget (Bake at 350) and was successful with the wet-on-wet royal icing technique, which has not always been the case for me. I love how they turned out! 3. When rolling out the cookies, roll them thinner than usual since they will be hanging, and bake them a little longer than usual so that they will be more firm. 4. Immediately after baking, use a drinking straw to make a hole in each cookie, in a stable spot. 5. Let cookies cool, and firm up, completely. 6. Outline cookies with royal icing and let dry for about 20 minutes. 7. If making polka dots, divide up small portions of the icing and add food coloring to each. Keep the rest of the royal icing white. All the royal icing should be the same consistency (the white and the polka dots). 8. Place each of the colored icings in an icing bag with a #3 tip. Fill about three cookies at a time with the white, and then add the polka dots. Repeat until you are all done. 9. Let the cookies dry overnight. 10. Thread raffia (or ribbon) through the hole in each cookie. 11. Tie each cookie to the main ribbon, spacing them as you'd like. 12. Hang up your garland and admire! Hani, Thanks so much for organizing this fun event! 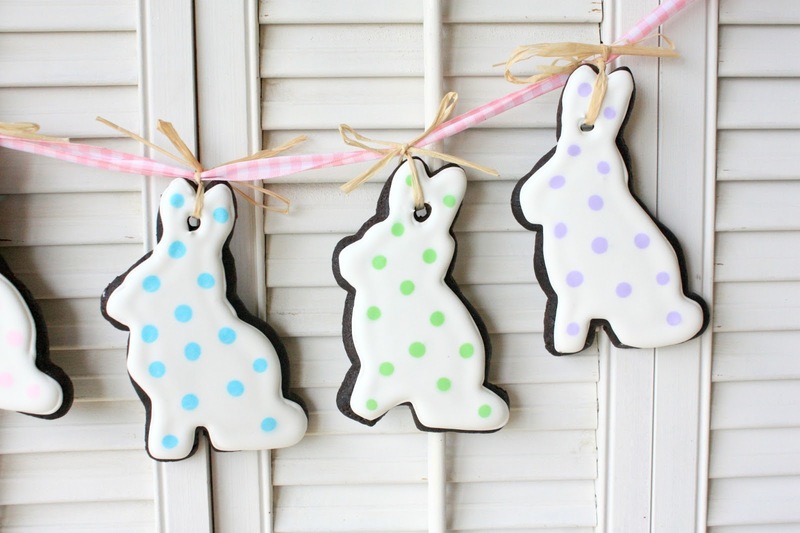 I am totally in love with anything that has polka dots and these bunnies are so cute. 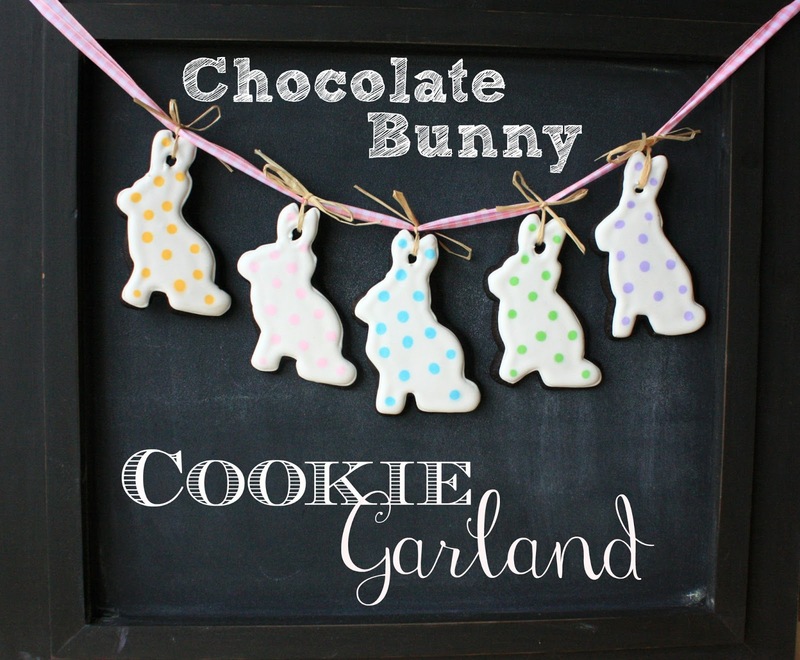 The garland is a cute decoration and would also be fun for a cookie eating game at an Easter party. Those bunnies are lining up for this party!! Cute idea!! Love it!! They are all so perfect! Adorable cookies the set up is cute as well. Can I please live in your head for just a day and try and absorb some of the creativity? Those are darling...too cute to eat! Those are SO pretty Sue! So darling, and I love teh way you photographed them too. So simple and cute, I love it! Love the polka dotted bunnies. I LOVE Hershey's Special Dark Chocolate! I use it in LilaLoa's recipe and they are the BEST!! The chocolate is wonderful in cakes as well. Your Garland is very cute. Thanks so much for sharing. I just LOVE this bunny garland and think I should make it and hang it all over my kitchen, perfect for anytime snacking! LOVE the polka dots! One of my favorites from the bunch. I looked at these darling bunny cookies and said..that has got to be Sue's! :) Love them! This is such a cute idea for Easter! Your garland is wonderful and fun and the dark chocolate cookie is a perfect backdrop to your sweet icing decorations. Cookie Garland....you are the most creative food blogger, ever. Cookie garlands are so much fun! Your bunnies are adorable! I came to know of the Chocolate Bunny Cookie Garland after visiting a friend’s house. I must admit that in addition to providing me with a healthy means through which I can satisfy my kids’ cravings for sweet foods, it provided us with a platform to bond while making the chocolate bunnies. It's really cute but also stylish. I love polka dots on cookies.